If the tremendous critical and commercial success of March of the Penguins back in 2005 suggests anything, it’s that nothing sells better than nature documentaries that anthropomorphize cute animals for mass consumption. Instead of simply allowing us to observe those Antarctican emperor penguins on their annual trek to their inland breeding grounds to find mates and give birth to new chicks, Luc Jacquet’s film—at least in its U.S. version—couched this profoundly primal behavior in middlebrow human terms: “This is a love story,” narrator Morgan Freeman intones early on. And every subsequent bit of behavior is characterized and/or explained as if these penguins were little people behaving for the benefit of audiences’ enchanted “oohs” and “ahhhs.” The unintentional takeaway from the film was the saccharine, sentimental notion that these emperor penguins were, well, just like us. Kedi, Ceyda Torun’s documentary about stray cats roaming the streets in Istanbul, isn’t always above such cutesy anthropomorphizing tendencies, and certainly the preponderance of loving cat close-ups suggests that Torun knows her audience and is willing to cater—or, if one is feeling less charitable, pander—to them as much as possible. But unlike March of the Penguins, Kedi also is, in part, a talking-heads documentary, with a slew of interview subjects either recounting their experiences with and/or observations of the many cats wandering around the streets. Shorn of any voiceover narration, the film leaves the anthropomorphizing to the interviewees themselves, allowing us in the audience to either adopt their viewpoint or view it all with a critical eye. Whether Kedi offers quite enough compensation for those who don’t already have an affection for cats going in is debatable. 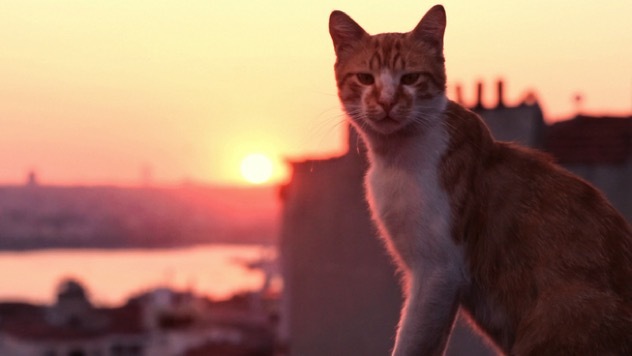 Occasionally, Torun’s film will dip into more philosophical tangents, as some of the interview subjects discuss the implications of cats and humans coexisting in the distinctive way they do in Istanbul. One person claims that a cat literally pointed him to a wallet full of money when he was feeling especially down-and-out. Another credits a cat for helping him lift himself out of a nervous breakdown. Kedi even grazes on spirituality in its view of tabbies. “Cats are aware of God’s existence,” says one interviewee, while “dogs think people are God.” As broad as some of these tangents are, a more city-specific thread underpins it all: the fear that rapid gentrification is perhaps threatening the harmonious union cats and people maintain in Istanbul. Mostly, though, such gestures toward the personal and philosophical remain surface-level, the better not to detract from the footage of the cats themselves that Torun captures. Kedi is structured in vignettes, with roughly eight distinct kitties garnering individual attention, and they certainly do appear to be a fascinatingly varied bunch behaviorally. One female feline is considered “the neighborhood psychopath” for her physically forthright manner, even with her supposed spouse; another only gets similarly territorial when it comes to protecting her offspring from other cats in a junkyard. Some cats are more sociable than others, with one acting as a kind of mascot to a street market; others keep to themselves, like the cat who hangs around a restaurant and gets the chefs’ attention by pawing at the window for food. Torun captures a wide variety of cats and cat behavior, and sometime she even finds a way to show us what life is like through their eyes, with what appear to be cameras somehow mounted onto the cats themselves so we see the world through a ground-level angle.Kedi may not add up to more than the sum of its parts, but its parts are, depending on your animal predilections, charming indeed.